Recent preprints can be found in arXiv, and papers appeared in IEEE publications can be found at IEEE Xplore. Y. Abdallah, M. A. Latif, M. Youssef, A. Sultan, and H. El Gamal, Keys through ARQ: Theory and Practice, submitted to the IEEE Transactions on Information Forensics and Security, May 2010. O. O. Koyluoglu, C. E. Koksal, and H. El Gamal, On Secrecy Capacity Scaling in Wireless Networks, submitted to the IEEE Transactions on Information Theory, Apr. 2010. O. Mehanna, A. Sultan, and H. El Gamal, Cognitive MAC Protocols for General Primary Network Models, submitted to the IEEE Transactions on Mobile Computing, Jul. 2009. K. Khalil, O. O. Koyluoglu, H. El Gamal, and M. Youssef, Opportunistic Secrecy with a Strict Delay Constraint, submitted to the IEEE Transactions on Information Theory, Jul. 2009. 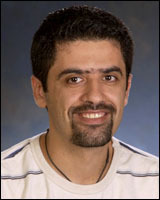 O. O. Koyluoglu and H. El Gamal, Cooperative Binning and Channel Prefixing for Secrecy in Interference Channels, submitted to the IEEE Transactions on Information Theory, May 2009. O. O. Koyluoglu, H. El Gamal, L. Lai, and H. V. Poor, Interference Alignment for Secrecy, submitted to the IEEE Transactions on Information Theory, Oct. 2008. L. Lai, H. El Gamal, H. Jiang, and H. V. Poor, Cognitive Medium Access: Exploration, Exploitation and Competition, to appear in IEEE Trans. on Mobile Computing, 2010. O. O. Koyluoglu and H. El Gamal, On Power Control and Frequency Reuse in the Two User Cognitive Channel, IEEE Transactions on Wireless Communication, Jul. 2009. L. Lai, H. El Gamal, and H. V. Poor, Authentication Over Noisy Channels , IEEE Transactions on Information Theory, Feb. 2009. S.-C. Lin, M. Shahmohammadi, and H. El Gamal, Fingerprinting with Minimum Distance Decoding , IEEE Transactions on Information Forensics and Security, Jan. 2009. L. Lai, H. El Gamal, and H. V. Poor, The Wiretap Channel with Feedback: Encryption over the Channel , IEEE Transactions on Information Theory, Nov. 2008. P. Gopala, L. Lai, and H. El Gamal, On the Secrecy Capacity of Fading Channels, IEEE Transactions on Information Theory, Nov. 2008. L. Lai and H. El Gamal, The Relay-Eavesdropper Channel: Cooperation for Secrecy , IEEE Transactions on Information Theory, Sept. 2008. H.-F. Chong, M. Motani, H. K. Garg, and H. El Gamal, On the Han-Kobayashi Region for the Interference Channel, IEEE Transactions on Information Theory, Jul. 2008. L. Lai and H. El Gamal, The Water-filling Game in Fading Multiple-Access Channels, IEEE Transactions on Information Theory, May 2008. K. Azarian, H. El Gamal, and P. Schniter, On the Optimality of the ARQ-DDF Protocol, IEEE Transactions on Information Theory, Apr. 2008. P. Gopala, Y-H. Nam, and H. El Gamal, On the Error Exponent of ARQ Channels with Deadlines, IEEE Transactions on Information Theory, Nov. 2007. K. Liu, H. El Gamal, and A. Sayeed, Decentralized Inference over Multiple Access Channels, IEEE Transactions on Signal Processing, July 2007. K. Azarian and H. El Gamal, The Throughput-Reliability Tradeoff in MIMO Channels, IEEE Transactions on Information Theory, Feb. 2007. A. Murugan, K. Azarian, and H. El Gamal, Cooperative lattice coding and decoding in half-duplex channels, IEEE Journal on Selected Areas in Communications, Feb. 2007. H. El Gamal, G. Caire, and M. O. Damen, The MIMO ARQ Channel: Diversity-Multiplexing-Delay Tradeoff, IEEE Transactions on Information Theory, Aug. 2006. L. Lai, K. Liu, and H. El Gamal, The Three Node Wireless Network: Achievable Rates and Cooperation Strategies , IEEE Transactions on Information Theory, Mar. 2006. A. D. Murugan, H. El Gamal, M. O. Damen, and G. Caire, A Unified Framework for Tree Search Decoding: Rediscovering the Sequential Decoder , IEEE Transactions on Information Theory, Mar. 2006. K. Azarian, H. El Gamal, and P. Schniter, On the achievable diversity-multiplexing tradeoff in half-duplex cooperative channels, IEEE Transactions on Information Theory, Dec. 2005. H. El Gamal, D. Aktas, and M. O. Damen, Noncoherent space-time coding: An algebraic perspective, IEEE Transactions on Information Theory, July 2005. H. El Gamal, On the scaling laws of dense wireless sensor networks, IEEE Transactions on Information Theory, Mar. 2005. A. Arunachalam and H. El Gamal, Space-time coding for MIMO systems with co-channel interference, IEEE Transactions on Wireless Communications, Jan. 2005. M. Bourles-Hamon and H. El Gamal, On the design of adaptive space-time codes, IEEE Transactions on Communications, Oct. 2004. A. Murugan, P. Gopala, and H. El Gamal, Correlated sources and wireless channels: Cooperative source-channel coding, IEEE Journal on Selected Areas in Communications, Aug. 2004. H. El Gamal, G. Caire, and M. O. Damen, Lattice coding and decoding achieve the optimal diversity-vs-multiplexing tradeoff of MIMO channels, IEEE Transactions on Information Theory, June 2004. M. O. Damen, H. El Gamal, and N. C. Beaulieu, Systematic construction of algebraic full diversity constellations, IEEE Transactions on Information Theory, Dec. 2003. M. O. Damen, H. El Gamal, and N. C. Beaulieu, Linear Threaded Algebraic Space-Time Constellations, IEEE Transactions on Information Theory, Oct. 2003. M. O. Damen, H. El Gamal, and G. Caire, On maximum-likelihood detection and the search for the closest lattice point, IEEE Transactions on Information Theory, Oct. 2003. H. El Gamal, A. R. Hammons Jr, Youjian Liu, M.P.Fitz, and O.Y.Takeshita, On the design of space-time and space-frequency codes for MIMO frequency-selective fading channels, IEEE Transactions on Information Theory, Sept. 2003. H. El Gamal, A. R. Hammons Jr, and A. Stefanov, Space-time overlays for convolutionally coded systems, IEEE Transactions on Communications, Sept. 2003. D. Aktas, H. El Gamal, and M. P. Fitz, On the design and maximum-likelihood decoding of space-time trellis codes, IEEE Transactions on Communications, June 2003. H. El Gamal and M. O. Damen, Universal space-time coding, IEEE Transactions on Information Theory, May 2003. H. El Gamal and A. R. Hammons Jr, On the design of algebraic space-time codes for MIMO block fading channels, IEEE Transactions on Information Theory, Jan. 2003. H. El Gamal, On the robustness of space-time coding, IEEE Transactions on Signal Processing, Oct. 2002. H. El Gamal, On the design of layered space-time systems for autocoding, IEEE Transactions on Communications, Sept. 2002. H. El Gamal and A. R. Hammons Jr, On the design and performance of algebraic space-time codes for BPSK and QPSK modulation, IEEE Transactions on Communications, June 2002. H. El Gamal and E. Geraniotis, Iterative channel estimation and decoding for convolutionally coded anti-jam FH signals, IEEE Transactions on Communications, Feb. 2002. B. F. Beidas, H. El Gamal and S. Kay, Iterative interference cancellation for high spectral efficiency satellite communications, IEEE Transactions on Communications, Jan. 2002. H. El Gamal and A. R. Hammons Jr, A new approach for layered space-time coding and signal processing, IEEE Transactions on Information Theory, Sept. 2001. N. Sharma, H. El Gamal and E. Geraniotis, Multiuser demodulation and iterative decoding for frequency-hopped networks, IEEE Transactions on Communications, Aug. 2001. H. El Gamal and A. R. Hammons Jr, Analyzing the turbo decoder using the Gaussian approximation, IEEE Transactions on Information Theory, Feb. 2001. A. R. Hammons Jr and H. El Gamal, On the theory of space-time codes for PSK modulation, IEEE Transactions on Information Theory, Mar. 2000. H. El Gamal and E. Geraniotis, Iterative multiuser detection for coded CDMA signals in AWGN and fading channels, IEEE Journal on Selected Areas in Communications, Jan. 2000.